Oryoki by Milical Veggie Bars 2 Bars are bars exclusively composed of ingredients of quality, selected for a healthy, balanced and ready in a few seconds. 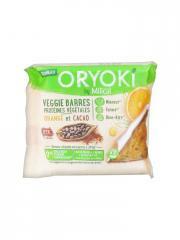 - 13g of vegetable proteins of quality, derived from guaranteed identity-preserved soy and oats. Proteins help maintain muscle mass. - The perfect quantity of carbohydrates (grapes, flakes of oats rice flour) and lipids (from sunflower). - 13 vitamins and 10 minerals including Magnesium and Vitamin C that help reduce fatigue. - Vegetable fibers of chicory and oats. For a slimming goal: at the two main meals of the day: 2 veggies bars. For a fitness and well-being goal: in snack, before or after physical exercise: 1 veggie barre. Pâte de Raisins 25%, Extrait de Chicorée (Fructo-Oligosaccharides), Protéines de Soja 20,7% (Lécithines de Soja), Flocons d'Avoine 12,2%, Huile de Tournesol 5,3%, Fèves de cacao 5%, Minéraux (Potassium, Calcium, Magnésium, Sodium, Zinc, Manganèse, Fer, Cuivre, Iode, Sélénium), Amidon de Tapioca, Flocons d'Oranges 0,9% (soit 5% en équivalent Fruit), Farine de Riz, Arôme Naturel de Cacao, Fécule de Pomme de Terre, Arôme Naturel d'Orange, Vitamines A, B1, B2, B5, B6, B9, B12, C, D, E, K, H et PP, sel. Fabriquées dans un atelier qui utilise des fruits à coque, des oeufs, du lait.